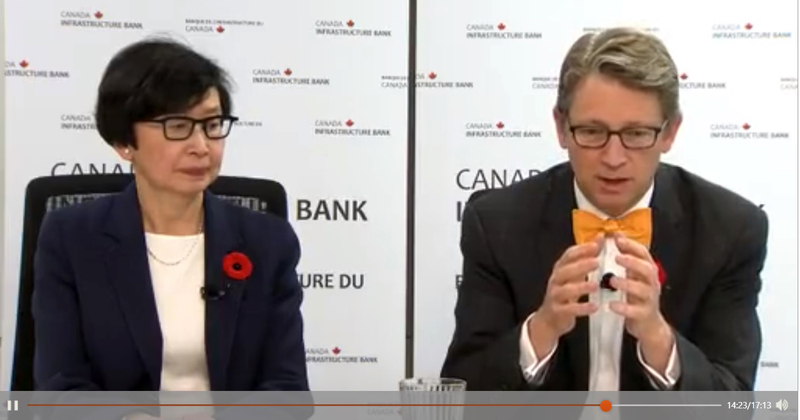 The Canada Infrastructure Bank (CIB) recently hosted an annual public meeting that lasted just 17 minutes, provided no information about its privatization plans, and made little effort to engage Canadians. CUPE staff were among the 73 people nationwide who took part in the online webinar. The meeting was far from transparent about what infrastructure the bank is considering privatizing, or which communities could be affected. The November 8 webinar was described as a chance for the public to ask questions and give feedback about the bank’s operations. However, the bank did the bare minimum to spread the word about the meeting and engage the public. Promotion was limited to posting a notice on the bank’s web site – far from robust outreach and engagement with communities, civic leaders and Canadians who will be hit with the costs of the bank’s high-priced projects. The bank already has a track record of secrecy and inadequate public engagement. The Liberal government buried legislation establishing the CIB in a massive omnibus bill and rammed the bill through Parliament. The bank’s board chair, Janice Fukakusa, gave very general introductory remarks. CEO Pierre Lavallée provided similarly broad comments before taking a handful of questions. But a moderator abruptly ended the question and answer period – before the meeting’s scheduled end time of 12:30 p.m. – leaving some of CUPE’s questions unanswered. After the meeting, CUPE staff were told these questions required information that wasn’t immediately available. Answers were posted a week later, on the bank’s web site. Bank CEO Pierre Lavallée recently told a friendly crowd at the annual conference of the Canadian Council for Public-Private Partnerships the bank has looked at 55 potential projects – half of which are unsolicited ideas from corporations designed to feed their bottom lines, not serve the public interest. He reported in his November 6 speech that the bank is “actively engaged” in discussions about 10 projects. He did not provide the same information to webinar participants. With work clearly underway behind the scenes, Canadians need full transparency about the bank and the projects it’s considering. The CIB takes aim at our roads, bridges, water and transit systems, and will hand unprecedented control of critical projects to for-profit corporations. As Canadians, we’ve built this infrastructure together. It belongs to us all, and it’s not for sale. CUPE posed the following questions in writing before or during the meeting. The first was answered during the meeting, and answers to the remainder were published online a week after the meeting. Q: Why does the CIB need to exist if it’s just going to give low interest government loans, like with REM? The government could do that directly, without this extra layer of expensive bureaucracy. A: The Bank was created to build a complete skill set – a set of capabilities to invest anywhere in the balance sheet of a new infrastructure project. In the case that’s referred to, as I mentioned in my opening remarks, the best role that we could play for that project in that situation was a 15-year senior secured loan. But we have the ability and the flexibility to invest in various forms of fixed income as well as equity in a specific project. And that is the expertise that we’re building, that is not the traditional expertise of government agencies. Q: The Canadian Union of Public Employees has filed access to information requests seeking the Blair Franklin Capital partners report analyzing the case for federal support for the Reseau Express Metropolitain light rail project in Montreal. We were provided with 2,000 pages of fully blacked-out information. Why is this essential information about how public funds are being used kept secret? A: The access to information request for the Blair Franklin Capital report that you are referring to was not made to Canada Infrastructure Bank. Blair Franklin Capital was engaged by Infrastructure Canada to support the Government of Canada in analysing and developing advice on the proposed REM project. Infrastructure Canada advises us that the 2017 ATIP response was redacted to protect commercially sensitive information about the project. Q: Will the Canada Infrastructure Bank commit to releasing an unredacted version of the Blair Franklin Capital Partners report, along with any and all other financial analysis that underpinned the decision to provide federal support – first as funding, and now as a repayable loan – to the REM? A: In the course of doing due diligence on any potential investment, the Bank may engage expert consultants for advice. This advice and analysis often contains commercially sensitive and confidential information, which cannot be disclosed. The access to information request for the Blair Franklin Capital report that you are referring to was not made to Canada Infrastructure Bank. Blair Franklin Capital was engaged by Infrastructure Canada to support the Government of Canada in analysing and developing advice on the proposed REM project. Infrastructure Canada advises us that the 2017 ATIP response was redacted to protect commercially sensitive information about the project. We have publicly disclosed the key terms of Canada Infrastructure Bank’s investment in the project. This was announced on August 22, 2018 and more information can be found on our website here. Q: How can you ensure that infrastructure projects pitched to you by the private sector for their potential revenue generating potential actually meet the Canadian public’s infrastructure needs? Shouldn’t it work the other way around? A: It does, in fact work that way. Each project that we consider, whether it originates from the private or public sector, must pass a public interest test to ensure that the project is well aligned with the relevant governments’ priorities and policies, that it contributes to economic growth and that it contributes to sustainability. While we welcome unsolicited proposals from the private sector, many projects that we consider originate from various levels of government and public-sector agencies. Q: How many participants were there in the CIB public meeting webinar (I would like figures for total number of participants who registered, as well as total number of people who participated in the full webinar)? A: We had 91 people register and 73 participated. A link to an archive is now available and posted on our website. Q: Please provide details of the methods the Canada Infrastructure Bank office employed – including paid advertising, public outreach, social media promotion, and all other strategies – to ensure robust public engagement and participation in the bank’s first annual public meeting. A: A notice of the Annual Meeting was posted in accordance with Treasury Board guidelines. This includes posting on our website one month in advance of the event. It was prominently displayed on the homepage during this time, as well as located in the News and Events section.